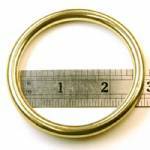 Solid brass ring has a 2 1/2" inner diameter. The brass is slightly over 1/4" thick. This ring is large enough to fit over most residential door knobs.